For those who have not been aware of this Tournament I enclose a brief description of how the day is organised. 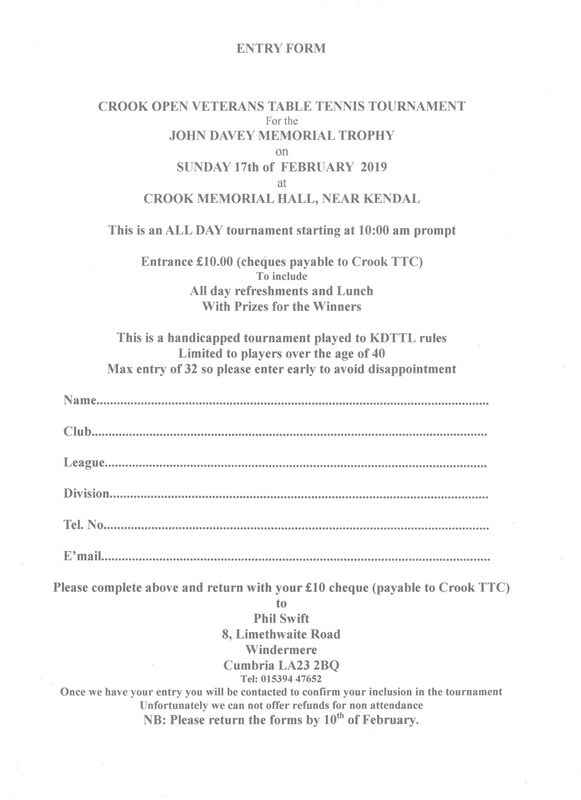 The Crooks Open Vets Tournament has been held each February for the last 18 years. As with all Vets play, all players have to be over 40 on the day of the tournament. It is a full day tournament with refreshments available all day long and a hot meal at lunch-time (all provided within the entry fee). The tournament is handicapped using the Kendal League handicaps system (based on results). Players from outside the Kendal league are handicapped appropriately in regards to their standard of play. In the morning session the players are divided into mixed ability groups, these groups are of 6-8 players. Each player plays each of the others in the group and from these results a group table is formed with the most successful player at the top. In the afternoon the top half of each group go on to play in a knockout competition for the ‘Cup’ whilst the lower half go on to play a knockout competition for the ‘Plate’.